Telehealth/telemedicine is being touted as a great innovation – the ability to talk to a provider anytime of the day from home for little or no cost. There are advantages and disadvantages. If you sponsor a health care coverage plan for your employees, you might have considered the option of including a telehealth or telemedicine benefit. Many insurers are encouraging the use of electronic health care as a way to reduce your and your employees' premiums and out-of-pocket costs while improving their access to health care. Two-way virtual visits between the patient and caregiver. Using videos, digital images and the Internet to transmit data. Visits conducted via desktop computer, cell phone or digital handheld devices such as PDAs or tablets. Remote patient monitoring, including a patient sensor or other on-site machine to transmit information through the web to a remote caregiver. According to the Global Telemedicine Market Outlook 2022 report, the telemedicine industry is valued at $29.6 billion and is projected to grow 19 percent from 2017 to 2022. Rutgers University found that approximately 90 percent of U.S. hospitals are on the path to implementing a telehealth program, with 50 percent already having a program in place. 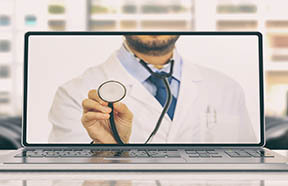 Before you jump on the telehealth bandwagon, however, consider the advantages for your employees and disadvantages of this benefit. Convenience and accessibility: According to a Cisco global survey, 74 percent of patients prefer the easy access of telehealth to in-person interactions with providers. Employees who have access to a telehealth provider can call and talk to a registered provider any time of the day without an appointment when they have a non-emergency situation. Providers have access to patients’ records and can make diagnoses and prescribe drugs. This is particularly helpful for those who live in remote areas. In addition, 24/7 access also eliminates travel time, scheduling conflicts and taking time off from work to go to a doctor’s office. In addition, everyone appreciates the ability to talk to a doctor in the middle of the night when traditional doctors’ offices are closed. Physicians like telehealth because, theoretically anyway, they can save time by selecting only the most serious cases for in-office visits. Cost Savings: A telehealth visit will either cost your employees the same as an office visit or may even be free. Either scenario makes it more likely employees will use the service and seek treatment when needed. Telehealth visits also reduce unnecessary, non-urgent emergency room visits. Increased Patient Care: Easier access increases the likelihood patients will seek health care when needed; keep their follow up appointments; ask questions; and report early warning signs. Fewer In-person visits: Patients who rely on telehealth for all their health care needs often forgo establishing a relationship with a primary physician. A primary care physician can spot potential problems because they get to know their patients. In addition, the telehealth provider might not have access to a patient's records, which could include information about the patient's care routines and history, thus increasing the risk of a misdiagnosis. In addition, not all procedures — even simple checkups — can be performed digitally. To discuss whether telehealth access makes sense for your employee benefits program, please contact us.